I must admit, though, that when I read the blurb on the back I wondered if I really had chosen this book. I’m not really into spy novels at all- so why had I nominated this one? I could only think that I was aware of his book Any Human Heart and must have been swayed by the comments about the book in the catalogue (which does beg the question ‘why didn’t I go for Any Human Heart then?) Oh well- no matter. This is a very good book for readers who don’t like spy novels. There are two alternating narratives. The first, told in the first person, is that of Ruth in the 1970s whose mother Sally begins acting very strangely. 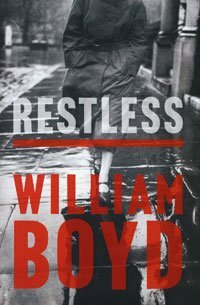 Her mother hands over to her, chapter-by-chapter, her autobiography that reveals that her mother is not, as Ruth believes, an English-bred housewife and mother but instead, a spy for the British recruited during WWII. The second narrative is the third-person autobiography itself, which tells of Eva (Ruth’s mother) and her recruitment and life as as a British agent, working to influence America to join the war effort during WWII. This part of the book is quite factual, based on British Security Coordination, an espionage unit based in the Rockefeller Centre. The descriptions in the book are very carefully written, with the eye of one trained to notice small details, as Eva was. Increasingly her daughter Ruth, and eventually you, too, as reader begin to scan the settings he describes with a heightened awareness as well. He brings the two narratives together carefully, leaving you quite unsettled about the ending. Normally I don’t particularly like alternating narratives because I come to favour one over the other and resent being tossed between them, but I didn’t feel that way with this book: I enjoyed each narrative equally. There’s not a lot of violence in this book (some, but not excessively) and it has much to do with identity, manipulation and distrust- all very human emotions at the intersection of relationships and this other, weirder world of espionage.